Simply... Lasagne | What Smells So Good? Okay... I'm back in the ring, albeit lying down... :D. I have a bunch of plans for posts coming up though, so I've got my boxing gloves on still, my body won't take me down that easily! So, this was what I made and saved for my mom and stepdad when they came home from work. They both said it was amazing, which made me happy since the SF never likes what I make haha! The flavours get a chance to blend during the chill time before baking, which is important… and convenient when you're working and want something to pop in the oven! This is also a perfect freezer dish too, so if you pull it out the night before and stick it in the fridge, it will be perfect when you come home from work the next day. In a large pot, bring heavily salted water to a boil. Add noodles and cook 5 minutes. They will still be firm. Remove from water, spread on cookie sheets in a single layer and allow to cool. Brown beef in a large skillet, breaking up with a wooden spoon into crumbles. Stir in crushed tomatoes, red wine, roasted red peppers and spices. Simmer 10 minutes, then stir in pumpkin puree. In a medium bowl, combine ricotta, spinach, milk and remaining spices. Stir until smooth. Spread a thin layer of the tomato sauce on the bottom of a greased 9x13” baking dish. Top with a layer of lasagne noodles, overlapping slightly. Add a thin layer of the cheese mixture, followed by a thick layer of sauce. 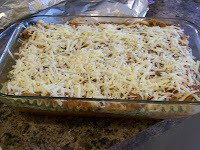 Top with noodles, then layer all remaining cheese mixture but ¼ cup on top. Top directly with the final layer of noodles. Combine remaining ricotta and tomato sauces in the skillet. Spread over the top layer of noodles. Combine the grated Mozzarella and Asiago in a bowl, sprinkle over sauce. Cover with tin foil and refrigerate 6 hours or overnight. 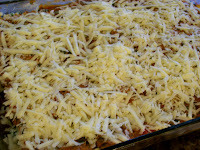 Uncover the lasagne and bake 45 minutes, tenting with foil if cheese starts browning too much. Well, I think that's all for today... time to get cookin' again! 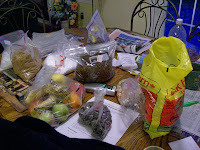 I have plans for some manicotti coming up, and I need to make a batch of sauce from the contents of the bag in the photo (apples, pears, oranges and bananas). Have fun with your own kitchen treasure hunts! i love you and i dont want you to over do it becareful baking, and hope i get to try some food when i get to see you again. hope you let your wings relax,and remember i always be holding you with love enjoy baking and hope i see you soon p.s. lasagne looks and sounds so good hehe .. can you make a vegetarian one? ?